It seems this week’s visit of UN’s Ban Ki Moon to Sierra Leone has opened a new political row, which the World Bank itself cannot resist getting embroiled in, as government and ruling party media attack journalists and critics of the Koroma government for its poor governance and corruption. Ban Ki Moon’s presence in Freetown, has once again cast a spotlight on the country’s post-war political and economic development. And like all spotlights, you get to see everything – the good, the bad and the not so pretty, which the government of president Koroma though, is painting as excellent stewardship. But the government is being accused by critics, the opposition SLPP and the media, of lying about its performance in office – especially the state of the economy and poverty. In such highly charged political atmosphere, few would expect the country’s World Bank office to take sides, let alone become a propaganda vehicle for the government. The impartiality and independence of international agencies working in Sierra Leone is paramount, if public confidence in the good work they are doing is to be maintained. Agencies and non-governmental organisations that are themselves publicly funded, must remain apolitical, and should resist entering into disrepute with the host nation. Many in Sierra Leone would argue that the role of the World Bank in the country – apart from splashing money on questionable programmes – such as the failed fibre optics initiative – whose value for money is yet to be determined, is to publish factual data and information about the projects it is supporting, and demonstrate their impacts on reducing poverty, job creation, new business start-ups, reforming the public sector, and promoting the well-being of the population. Yet yesterday, in response to the ongoing row between the government and independent journalists and critics of the failed government policies, the World Bank issued a statement accusing local media of going into “overdrive”. The whole nation was called to attention, opposition political parties and civil society were in attendance and the president was as effusive in recounting the tall role of the international community in restoring peace and democratic governance to the country; then the media went in overdrive in their reportage. The event was the visit of the United Nations Secretary General, Bank Ki Moon to formally fold up his organization’s mission in Sierra Leone. Ban Ki Moon jetted into Freetown for a two day visit from 04/03/14 to 06/03/14 for the official close down of the United Nations Integrated Peace Mission in Sierra Leone. About twenty-three years ago in 1991, war broke out in Sierra Leone and in the words of President Koroma; “So many of our people suffered in the process, so many were displaced, murdered and improvised, but they stood firm and ushered in a return to democracy and civilian rule in 1996″. This follows the military intervention of the regional West African Economic Community Monitory Group ECOMOG which halted the rebels and paved the way for a broader international involvement lead by the United Nations in resolving the Sierra Leone conflict through a negotiated agreement. Thus UN has been in the country for over 15 years transitioning itself over the years to respond to the situation as it unfolded. The first was the United Nations Mission in Sierra Leone (UNAMSIL) established as a United Nations peacekeeping operation in the country from 1999 to 2006. Its mandate was to help with the implementation of the Lomé Peace Accord, an agreement intended to end the Sierra Leonean civil war. UNAMSIL expanded in size several times in 2000 and 2001to become the largest UN peace keeping operation at the time. It concluded its mandate at the end of 2005. UNAMSIL was succeeded by the United Nation Integrated Office for Sierra Leone (UNIOSIL) to consolidate peace and assist the Government in strengthening human rights, working towards the Millennium Development Goals, and paving way for free and fair elections in 2007. Most importantly, UNIOSIL’s mandate was to cement the gains of its predecessor. Then, UNIOSIL transitioned into the United Nations Integrated Peacebuilding Office in Sierra Leone, UNIPSIL. The mission comprised around 80 staff under the leadership of ERSG Jens Toyberg-Frandzen, has been supporting the people and the Government of Sierra Leone since 2008. Its core functions included providing political advice to foster peace and political consolidation, supporting the national police and security forces and building the capacity of democratic institutions. “The international community has stayed the course through the challenging process of keeping, consolidating and building peace” said the UN scribe said. But Sierra Leone has made significant advances over the past decade in light of which UNIPSIL will draw down by 31 March 2014. It will transfer its residual activities to the Government and the international community in Sierra Leone, including the UN presence there. There are 17 agencies, funds and programmes that help advancing the country’s national development Agenda, for Agenda for Prosperity. In a separate meeting with the UN Country Team, the World Bank Country Manager, Francis Ato- Brown emphasized that the international community should not lose sight of the result needs for the transformation of the country. “The Country Team should leverage the collective resources of the different agencies to meet the challenges and the government should focus on ensuring inclusive growth as well as maintaining the peace, strengthen institutional capacity and make transformational choices in its development agenda”. As the mission finally closes down, the impact of the international community’s efforts are visible in country’s progression. At a joint press conference with the Secretary General, a proud President Koroma could not have been more articulate; “Later this month, Sierra Leone will address the United Nations for the last time as an object of consideration by that august body. We have now moved from a country on the agenda of the Security Council to a nation that is a storehouse of lessons on how to successfully move away from war to peace and development”. The story of Sierra Leone has definitely changed for the better and the country president’s statements are as poignant as the progress on the ground is concrete; “a country that once received peacekeepers is now contributing peacekeepers to other countries; a country that was once a byword for humanitarian crisis now has the second fastest growing economy in the world; a country that succumbed to military dictatorship has held a succession of free and fair elections; a country rocked by armed and uncivil divisions is healing itself. Now, we have taken a collective decision to move towards becoming a middle-income nation by 2035”. President Koroma however admits,” We still face challenges and Bank Ki Moon agrees: “….still half of your population lives under the poverty line, still there are many women and children dying from preventable diseases. “These [are] needless deaths, we have to prevent. You have to educate people. You have to enhance the capacity of your people. “You have to put more foundation of the rule of law and also [do] more to protect and promote human rights and particularly those of vulnerable people, women and girls and small minority groups. “Therefore, it is very important that the President and the government and the people work together to promote further democratic process, including human rights”. 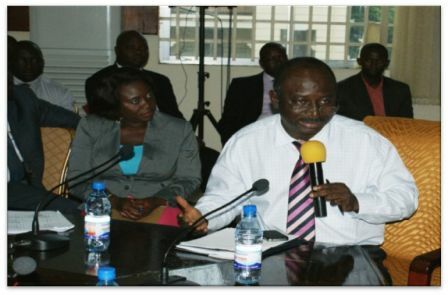 The Secretary General however assured the nation that the closure of UNIPSIL is not the end of the UN’s active involvement in Sierra Leone; “Today we will formally close UNIPSIL – but the UN Country Team will continue to accompany the people and Government of Sierra Leone on the journey to long-term development. 1. How much has the World Bank spent in Sierra Leone since the end of the war in 2001? 2. How has that money been spent? 3. How many people in Sierra Leone have been brought out of poverty as the result of World Bank’s funding? 4. How many jobs have been created in Sierra Leone as the result of World Bank’s funding? 5. How many businesses have been established in Sierra Leone as the result of World Bank’s funding? Whilst the World Bank is highly regarded for supporting the development of Sierra Leone since the end of the war in 2001, it is important that it does not become the mouth piece and propaganda organ of president Koroma’s government, which many in Sierra Leone believe to have failed the people of Sierra Leone.